Celebrate spring in your preschool classroom with the nursery rhyme “Mary, Mary, Quite Contrary.” Preschool lesson plan ideas for math using flowers are ideal for this theme. It is perfect for spring since flowers are beginning to make their debut this time of year. Your little ones will practice one to one correspondence, matching by color and shape and counting from one to twelve. You will even provide a patterning activity using this “Mary, Mary Quite Contrary” flower box activity. Students will count objects one to twelve. Students will match according to shape and color. Students will correctly use one to one correspondence. Students will use basic patterning skills. Using cardstock sentence strips, draw a repeating pattern of flowers that matches the popsicle stick flowers that you have made. Make several different pattern cards, each with five or six flowers on them. Match the flowers by color and shape. Have the student stick all of the yellow flowers in the flowerbox, then all the blue ones, etc. Then have the student place all the silverbells, cockleshells or pretty maids in the flowerbox. Count the flowers. The student will count the number of flowers from one to twelve. This can be modified for individual abilities. Teach one to one correspondence. The student will place one flower in each of the egg carton slits. The counting can be done as the student places the flowers into the box. Teach patterning. Use the flower pattern cards for this activity. Have the student recreate the pattern on the pattern card by placing the corresponding flower into the flower box in the same order as the flowers on the pattern card. 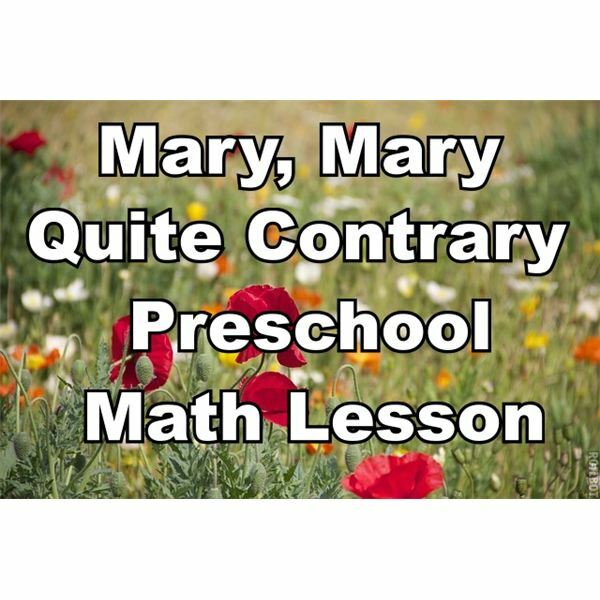 Your little ones will love this Mary, Mary, Quite Contrary preschool lesson plan for math. It will be more like play to them, but you can be sure they’ll be learning the whole time. You can be sure of one thing, this activity will be one of the most popular centers to pop up this spring!